Image by Sim Dawdler via FlickrMy following post don't have to look as a complain. It's simply my very direct way to present things. One year ago, I signed a one-year contract for Fitness First/German branch, of course. Very close to my house, clean and safe environment, careful and good English speaking people, good trainers and perfect diversity of the classes. Nothing to complain about this (excepting, maybe, that last summer, when it was impressively hot, the functioning of the air conditioning was seriously limited, for health - not my opinion - and cultural - "we" are not like - the country where you use extensively air conditioning -...reasons). But, as one month ago I graduated successfully 12 months of good training and my travel schedule for the next 3 months doesn't look very friendly, I decided (neglecting the cruel reality) to talk with the representatives of my beloved Club about my intention to suspend my membership for the coming 90 days. Went first one week ago explaining shortly, in a paced and clear German, what was my problem. "Why you can't attend the club? ", I've been asked. "I have some business and private travels", I answered, a bit surprised by the directness of the question, as despite the friendly smile of the girl I was talking with, I was not supposed to be there for various confessions. "In this case, you need to bring a paper from your work justifying the periods you will not be in Berlin". "Excuse me? ", and my question was in English, as when my logical understanding escapes, the German words are more than evanescent and my final sentence is nothing more than a successful dadaist poem. And she repeated the request in English. "But I am travelling in private interest and I am self-employed"..."In this case, you need to establish an appointment to discuss about this with one of our representatives". 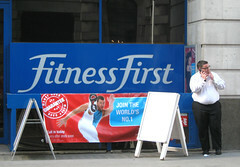 I always knew this Fitness First is a serious business. The next day, I was repeating again my problem, ending my monologue on an optimistic tone "An now, what kind of papers do I need to sign for setting the issue". But...surprise surprise..."I am afraid that it is not possible to suspend the membership now". Big eyes, not so friendly thoughts in English, the language I set for the rest of the conversation (adrenaline was reaching high levels): "How comes it is not possible?". "If you want to suspend your membership, you have to announce three months in advance (the wording of my renting contract, or the usual line in job contracts), or to find somebody to replace you in the next 3 months...Or to bring an official justification from your office". Annoyingly serious..."And, if not? ", I insisted in a hopefully middle-eastern hunger for finding an open door for negotiation. "It is not possible", the blonde lady answered me. As usual in this kind of situations, I am switching immediately to the "logical" arguments: "But it doesn't make sense. As long as I paid for one year, 12 months, why you don't give me the freedom to suspend or to go away. Why the contract is automatically updated after one year? And what it is with this official explanation from the office? It is my free and private time, do I need to explain what I am doing in my free time?". "I am very sorry, but those are the rules" and repeated again the regulations - the official explanation, the replacement or...or..."In this case, I should pay even if I am not attending? "...This is the kind of stupid question asked only to fill the unbearable void of stilness..."Yes", the unsurprising answer come. Thereafter, I was sharing my experience with another expat friend. Our common conclusion was that, normally, when you care about your services - similarly to the US standards, let's say - you care about every single client you have. Logically enough - the kind of rationality the RULES don't have - if one client is unhappy, he or she is telling to another current or potential client (what I've done) and most likely, you'll think twice before making a choice. And you start this by having trained people - the lady-consultant I was speaking yesterday was rigid to unfriendliness - with social skills and able, if not to offer you a solution, at least to convince you that the choice offered is the best. In my case, as in other situations I've encountered in Germany, the magic word is "those are the rules". I don't have any problem with respecting the rules, but I would prefer, if possible, to be took seriously enough for being offered explanations. I strongly believe that social intelligence is an useful skill whose smart use makes our life breathable. Now, I am very sorry, but I have some free time and got to go to Fitness First for the next hours, in order to be sure that my monthly payment is not only a cold bank transfer but has also a certain value.